WADA provides for a range of information and interactive education possibilities on its website. 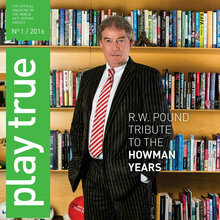 Recently WADA launched a new digital-only, interactive Play True magazine. The new look publication, which replaces the former print and online version, is now available to all supporters of clean sport worldwide through WADA’s website and digital devices including iPhone, iPad and Android. Every edition of the magazine include sections on WADA’s main activities: from anti-doping development to athlete outreach, education to compliance, and science to testing. 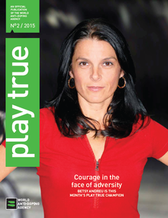 The magazine also includes a new feature, Play True Champion, highlighting an individual that has put their stamp on the clean sport movement. Educate yourself in anti-doping – it could save your career! WADA’s Play True Quiz is an interactive game that tests athletes’ knowledge about anti-doping. Welcome to WADA’s Youth Zone, where you can find information on drug use in sport and why it is banned. In order to cater to the various learning styles of coaches, WADA has created CoachTrue, a computer-based anti-doping learning tool. Vitamins and minerals (when not consumed in food form) are classified as dietary supplements. Amino acids, botanicals, herbs, and substances such as enzymes, organ tissues and glandulars, and metabolites, are also classified as dietary supplements. Many athletes believe they do not get enough vitamins and minerals in their diet and wonder if they should start taking some sort of supplement; while other athletes are on a constant quest to find the latest diet or supplement that will give them a competitive edge. The reality is that making wise food and beverage choices are crucial for peak performance and contribute to endurance and repair of injured tissues. A good working knowledge and understanding of foods that provide essential nutrients will aid in an athlete reaching their greatest potential. Athletes have increased energy needs, which allows for more opportunities to obtain the nutrients they need through a balanced diet composed of a variety of natural foods. Most sports medicine professionals agree that unless an individual has a nutrient deficiency, supplementation may not improve athletic performance. However, the athlete who takes a simple one-a-day type of vitamin or mineral that does not exceed the nutrient levels of the Recommended Dietary Allowance (RDA)/Dietary Reference Intake (DRI), is probably not doing any harm. An athlete should consult with his or her physician, or other health care professional, to determine whether vitamin and mineral supplementation is needed to maintain optimal health. 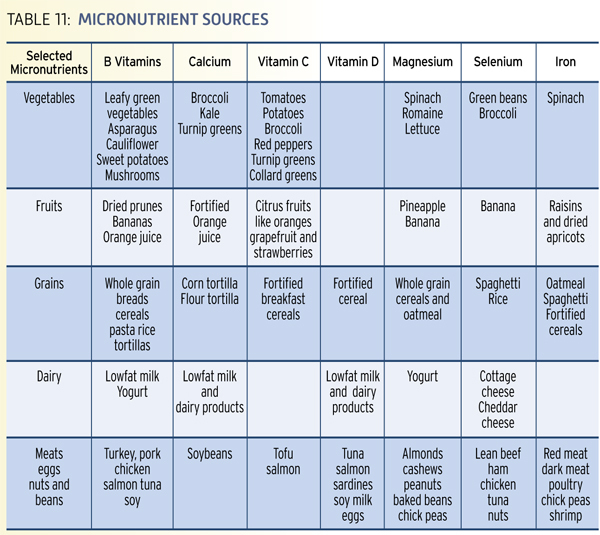 Nutrients that may be low in an athlete’s diet are listed in following chart. Choose a variety of foods in each food category to ensure that all nutrients are included in your diet. Natural foods contain a matrix of various nutrients that researchers are continuing to discover and learn more about. Often individual nutrients don’t work as effectively when isolated in a pill or supplement form. Self-prescribed supplement users should heed overdose warnings and look for symptoms of toxic levels of supplementation, such as diarrhea, skin rashes that do not fade, and unexplained joint pain. Fat soluble vitamins (A, D, E, and K) can be toxic when misused. Unlike water soluble vitamins in which excess amounts are excreted in the urine, fat soluble vitamins are stored in body fat and remain in the body. Athletes should always choose food over dietary supplementation. The body needs more than 40 nutrients every day and supplements do not contain all the nutrients that are found in food. Supplements cannot make up for a poor diet or poor beverage choices. Athletes searching for a competitive edge often look to a supplement or a special combination of nutrients to find it. However, there are no quick-fix supplements for improving sports performance. Consuming a wide variety of foods and staying well hydrated are the basic cornerstones to reaching athletic potential. For athletes subject to sport drug testing, taking nutritional or dietary supplements may cause a positive test for a prohibited substance that may not be disclosed on the product label. In accordance with all applicable rules for a positive test result within a sport, a sanction may be imposed. Some trade associations and other businesses have programs that include analytical testing and quality assessment of dietary supplements, culminating in a “stamp of approval’ or a “guarantee” that the supplement is safe for use in sport. These programs may reduce the risk that a supplement is contaminated, or contains an undisclosed ingredient. HOWEVER, it does not eliminate this risk. Athletes who take dietary or nutritional supplements, even if claiming to be “approved” or “verified,” do so at their own risk of committing an anti-doping rule violation, or suffering from negative health side-effects. You can find some advices in your National Anti-Doping Agency pages. example of such guide can be find here.